Constantly peeking over walls at gardens for inspiration? Scrapbooks over flowing with the pictures and ideas you like and think you have a really good idea of what you want for your garden? We haven’t used a designer before… what is the process? How do you operate? The amount of interest they are showing in what you are wanting to create is really important. If you feel the designer is ticking all those boxes then you have probably found someone that you can work with. By the end of that initial consultation the designer should have a good idea of what is required and will be able to give you a quote or cost estimate for their design fees. This will obviously help you to make your final decision! Can I get a “Design and Build” type package? The first thing to point out is that most designers are specialists – they DESIGN, they don’t build. We don’t do the construction. We leave that to the construction experts – the contractors – and I am always trying to emphasis that people should use a designer for the design and a contractor for the construction. Attempting to get an all-in-one package is in my opinion a mistake because it is extremely rare in New Zealand (if not impossible) to find a company or individual who is excellent at both. I always say it’s like getting a builder to design your house – you are never going to end up with anything that is really beautiful but you will have something that stays up! Equally – you wouldn’t get an architect to build your house…so I won’t be building your garden! Usually the designer will have a selection of contractors who they work with and recommend, and will either organise this phase for you or at least be on hand to deal with any issues which arise. This is worth pointing out because many people aren’t sure exactly what a landscape designer/landscape architect does and where their works stops and the contractor starts. Once you have given the “go ahead” I will come back and do a site survey and will measure up the house, the garden, existing planting and any existing structures or elements we are planning on keeping. I will also get any levels I need – spot heights and/or contours. I also take photos to record detailed site information which may affect the design. With very complex jobs and sites or very large sites I may recommend using a surveyor but usually I do the surveys myself. It is a great chance to really get to know the site! I then have an accurate base plan on which I can overlay design ideas and develop your concept design. Then I will come round to your place to present you with the concept plan and go over the ideas with you. We will look to see how it fits on the site, discuss what ideas you like (and what ideas you don’t like!) juggle with it a bit and discuss changes – small and sometimes large changes. If people don’t like certain areas of what I have done that’s fine, we come up with other ideas and modify it and then I will draw up your final plan. This is the plan that goes out to the contractors for pricing. What will the final set of plans consist of? That final set of plans can include the overall layout plan, working drawings, general site cross-sections and elevations, and/or construction drawings to guide the contractor during the construction process (and also to clarify the details during the pricing process). Finally once these plans are approved by you they go out to tender. You could build it yourselves from these plans – if you are a handy DIY type! – but usually I would either send it out to landscape contractors/builders for you or give you a short list of contractors I would recommend to approach for pricing the job. Often there are a few questions from the contractors at this point and I am always available to help clarify any points on the plans and even meet on site if necessary. Once the quotes are in you can compare the various prices, start dates, duration times etc and make your decision. I am happy to help you with this process also if required. Finally you sign a contract direct with the landscape contractor/builder. When the project is underway I will pop back as required to oversee the project or check on how things are going or answer any queries over the phone or so on. Once the contractor is on site I step back. I am available of course to deal with any issues which may arise but generally the contractors I recommend are so good,so professional and so used to working on my projects that I don’t have to have a huge amount of input at that stage. Finally once the contractors finished, it’s often time to think about the planting and clients usually get me back to discuss the planting and/or to do a planting plan. This is often one area where you may be inclined to do the work yourselves – ordering the plants and planting them is a fun process especially if you have a little knowledge about plants and their basic requirements. If you would prefer to get a contractor to do this for you then we go through the same tendering process again – getting this phase priced and installed. My involvement at this stage is usually limited to recommending substitutions if any plants are unavailable, checking the plants laid out on site prior to planting and occasionally inspecting and checking the planting before you make your final payment to the contractor. . I am in discussions with 3 other designers. Is there much difference between designers? Every designer has become involved in the industry for different reasons. Some are fully qualified Landscape Architects who have studied the profession for years at university, some have done a horticultural course or a design course at a polytech or similar, and some have simply decided to start designing their own garden and then gradually begun designing for friends etc and slipped into the industry that way. The confusing thing for prospective clients is that all of these people usually refer to themselves as landscape designers! It is worth finding out what qualifications they have but this is not the only important factor to consider when selecting a designer. Every designer will have different design preferences, different skills and a different general style. Most designers also have a preference for a particular range of garden scales – some prefer smaller gardens, others enjoy designing large spaces. Some designers are more comfortable than others with large, complex projects as in very 3 dimensional/steep site projects. These are often very intensive construction projects which could require multiple retaining walls and excavation etc. 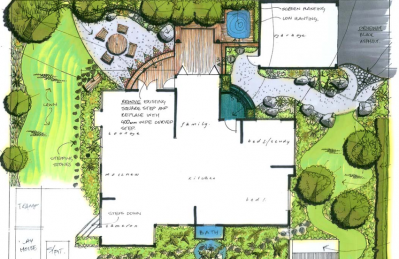 Multi-level complex design solutions are beyond the scope of most garden designers. It would be highly advisable to work with a landscape designer (or preferably a fully qualified Landscape Architect) who has experience working with more 3 dimensional projects if you have this sort of project in mind. Often engineers need to be engaged as part of the design team and the designer needs to be comfortable working with them and maintaining control of the visual design aspects of the project. Some designers are geared more towards the planting so they will emphasis the planting and will play down or be less interested in the construction side of the project. This is fine if you only require planting advice.